PJ and Monty have experienced more than their share of heartbreak in their first months of life, but thanks to the kindness of a few caring folks, they have the chance to feel happiness, too. The two baby rhinos, both less than 6 months old, were rescued as orphans from the wild in South Africa. Today, they live on a sanctuary run by Saving the Survivors, a group dedicated to protecting the living victims of Africa's poaching epidemic. There, PJ and Monty are getting the care they need to grow up big and strong - which, of course, includes plenty of time to play. 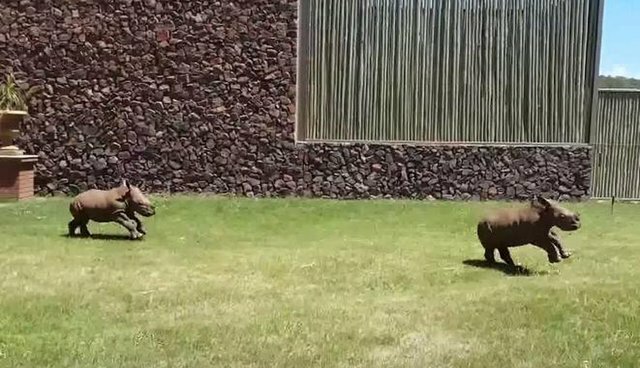 Just watch as they frolic in the sanctuary yard, chasing each other around like children. Paul Oxton, who filmed the clip above, knows better than most the importance of giving rhinos like PJ and Monty a second chance. His group, Wild Heart Wildlife Foundation, helps fund this and other sanctuaries through donations from the public. "People don't always realize what's left behind by the poaching scourge we face. Oftentimes, when an animal is poached, there's a young one left orphaned," Oxton told The Dodo. "The people taking care of these animals rely on public support since they don't get government help. It's something that people need to think about. Taking care of the survivors of these killings is what drives me." Visit Saving the Survivors and Wild Heart Wildlife Foundation online to find out how you can help.